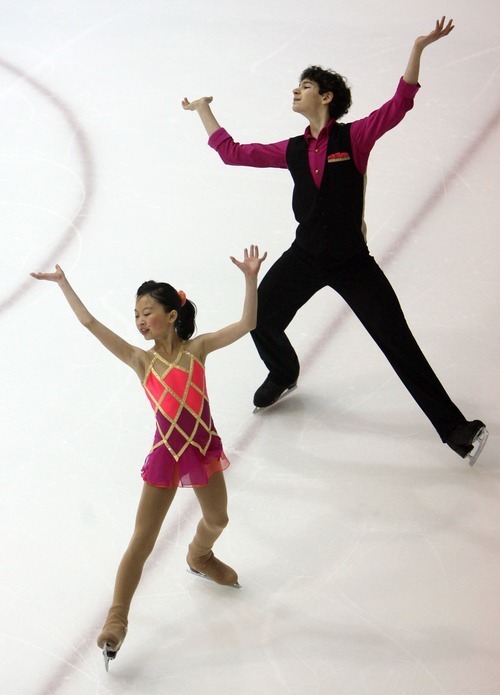 Figure skating • Pairing young skaters is tricky, but can pay off. Steve Griffin | The Salt Lake Tribune Sophia Dai and Jeffrey Fishman compete during the intermediate pairs event at the U.S. J Steve Griffin | The Salt Lake Tribune Caroline Yu and Brian Johnson twirl in a circle during the intermediate pairs event at th Steve Griffin | The Salt Lake Tribune Skaters warm up before their event during the intermediate pairs event at the U.S. Junio Steve Griffin | The Salt Lake Tribune Hailee Settle and Rique Newby-Estrella compete during the intermediate pairs event at t Steve Griffin | The Salt Lake Tribune Hannah Klopstock almost touches the ice with her head as her partner David Botero holds Steve Griffin | The Salt Lake Tribune Gabrielle Smeenge and Micahel Johnson spin in the air during the intermediate pairs even Steve Griffin | The Salt Lake Tribune Gabrielle Smeenge and Micahel Johnson spin during the intermediate pairs event at the U.
Steve Griffin | The Salt Lake Tribune Sophia Dai and Jeffrey Fishman compete during the intermediate pairs event at the U.S. Junior Figure skating championships at the Salt Lake City Sports Complex Friday, December 17, 2010. Steve Griffin | The Salt Lake Tribune Caroline Yu and Brian Johnson twirl in a circle during the intermediate pairs event at the U.S. Junior Figure skating championships at the Salt Lake City Sports Complex Friday, December 17, 2010. 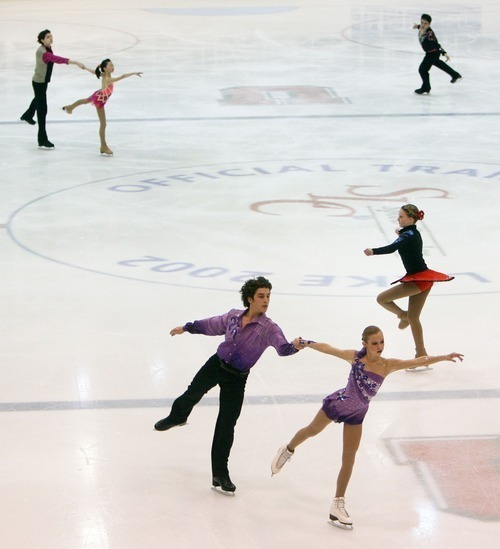 Steve Griffin | The Salt Lake Tribune Skaters warm up before their event during the intermediate pairs event at the U.S. Junior Figure skating championships at the Salt Lake City Sports Complex Friday, December 17, 2010. Steve Griffin | The Salt Lake Tribune Hailee Settle and Rique Newby-Estrella compete during the intermediate pairs event at the U.S. Junior Figure skating championships at the Salt Lake City Sports Complex Friday, December 17, 2010. Steve Griffin | The Salt Lake Tribune Hannah Klopstock almost touches the ice with her head as her partner David Botero holds her arm as the pair compete during the intermediate pairs event at the U.S. Junior Figure skating championships at the Salt Lake City Sports Complex Friday, December 17, 2010. Steve Griffin | The Salt Lake Tribune Gabrielle Smeenge and Micahel Johnson spin in the air during the intermediate pairs event at the U.S. Junior Figure skating championships at the Salt Lake City Sports Complex Friday, December 17, 2010. Steve Griffin | The Salt Lake Tribune Gabrielle Smeenge and Micahel Johnson spin during the intermediate pairs event at the U.S. Junior Figure skating championships at the Salt Lake City Sports Complex Friday, December 17, 2010. Watching 14-year-old Robert Hennings and 11-year-old Elise Middleton perfectly in sync during the U.S. Junior Figure Skating Championships makes it easy to believe the two had been partners for more than three years. Their winning performance in intermediate pairs was phenomenal. With the exception of a few slipups, every spin, every leap, every flourish seemed to be in harmony  much like the pair themselves. "You just have to trust your partner," Hennings says. "It's teamwork, and if one person isn't into it, it's not going to work." Pair skating is an interesting exercise in choreography, timing and trust. The boy and girl in a pair must learn to share the type of confidence that allows them to spin and throw each other across the ice. Naturally, it's always tricky to match the right skaters with each other, but working with athletes as young as 8 or 9 years old provides extra challenges. Coaches have to worry about down the road, when adolescence could take its course and force a pair apart. That's what happened to Michael Johnson, 16, who split with his four-year partner and best friend when she got taller and lifts became difficult. He says it was difficult to leave her, but he was lucky enough to find a new partner in 14-year-old Caitlin Belt at the University of Delaware Figure Skating Club. "She was a little shy at first, but we got along pretty well soon," says Johnson, who finished in second place with Belt. "When you train together so much, your partner almost has to be your best friend." It's one of the key elements in matching the perfect pair, but far from the only one.